Those that have lived in Asheville for more than a decade can remember when the Biltmore Square Mall was one of the most popular places to shop. Well, that changed quickly, especially after the recession. The KB Toys and shoe stores at the Biltmore Square Mall were one of the only reasons to head south of Asheville. 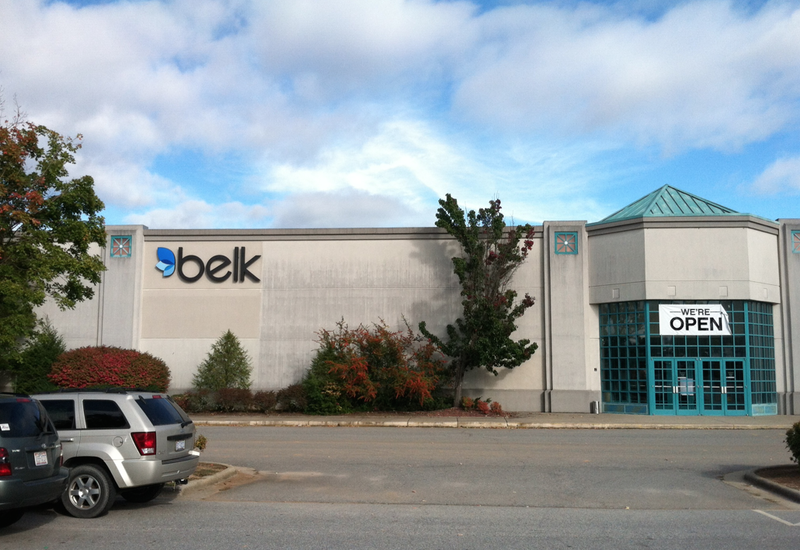 Most people continued to go to the Asheville Mall that is on Tunnel Road. Now that the Biltmore Square Mall is limited to Belk, Dillard’s Clearance Center, Cinebarre and Dollar Tree it is time for a major player to step in and take over the property. That is exactly what New England Development did. 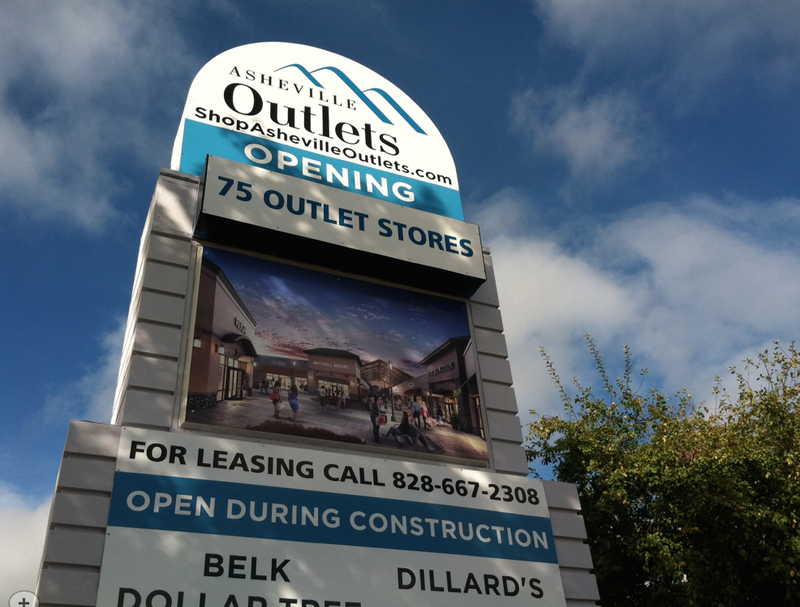 Enter the Asheville Outlets, a new development brought to the greater Asheville area by New England Development, which promises to open its doors to shoppers in the Spring of 2015. 75 big-name manufacturers are expected to open stores in the new outlet mall, though an official release of the list of stores has yet to be made public. Update: There will be a Field and Stream store at the Asheville Outlets which will be the second Field and Stream store in the state of North Carolina with the other location being in Cary, North Carolina. I will try to post some photos of the Field and Stream store in the next few days. UPDATE: Here are a few photos that were taken in September 2014. Notice that Belk, Dillards, Dollar Tree and a few other stores are still open. Also notice that it is quite obvious this is going to be an outdoor shopping mall. 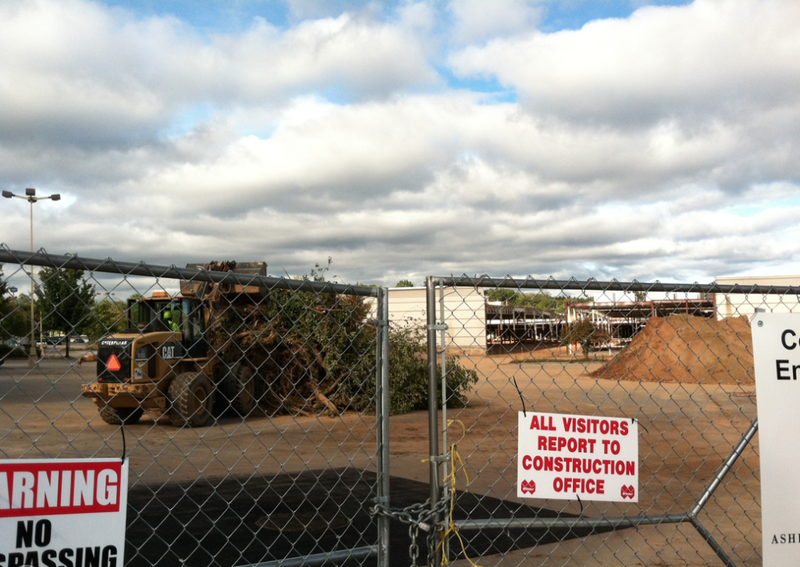 Over the next several months the old Biltmore Square Mall will be inaccessible. 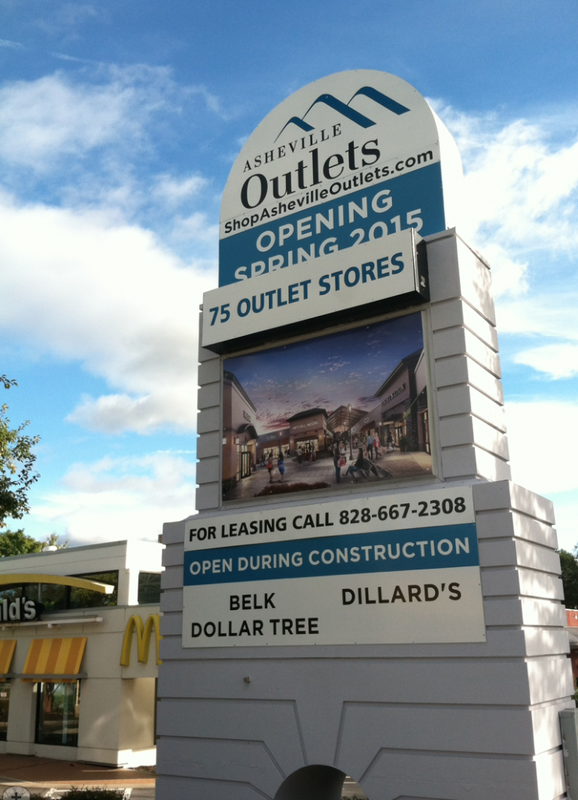 The construction is already underway and most of the billboards are stating that the Asheville Outlets will be open in the spring of 2015. 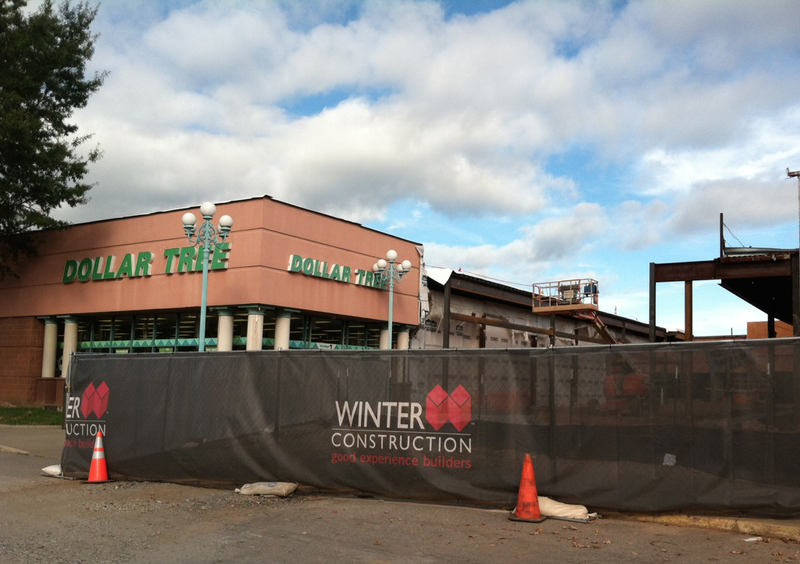 It will be interesting to see what particular retailers will be part of this shopping locale. 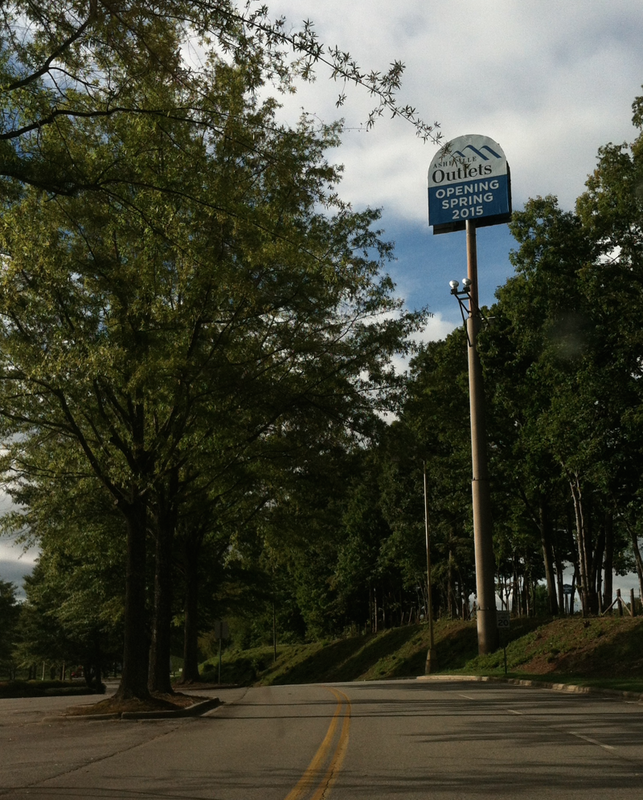 If you are in or around Asheville you may also want to check out the Murphy NC Cherokee Indian Casino. What Stores Are at the Asheville Outlets? What Stores Are at the Ashevillee Outlets? After scouring the Internet for information I found almost nothing on the stores that will be in or at the Biltmore Outlets. Interestingly, the photos of this particular outlet mall show it as being an outdoor outlet mall. This type of renovation was completed at North Hills in Raleigh, North Carolina and it was done very well. North Hills was an indoor mall for years before being renovated into an upscale outdoor shopping destination. 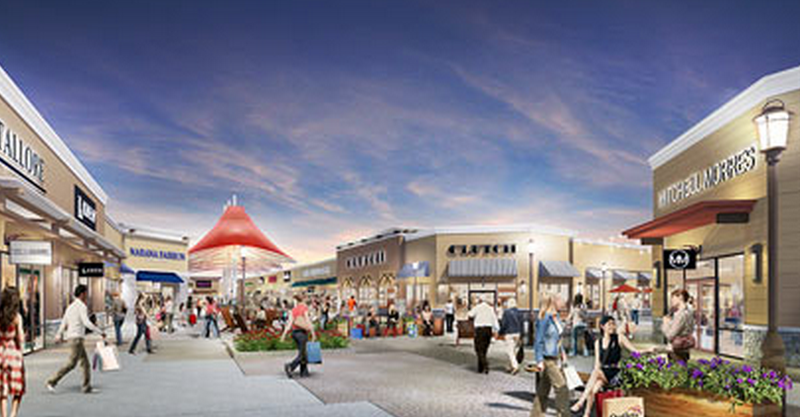 Even though North Hills is not an outlet mall I feel as if it is going to be very similar to the Biltmore Outlets. The fact that there are no outlet malls within 80 miles of Asheville means there is a great opportunity for the New England Development company. Interestingly, the New England Development company has a large presence in the airport industry as well. Their main region is Boston and the New England area and this will be their first retailer shopping mall location in the state of North Carolina. They also have locations in Florida in West Palm Beach. After shopping at Concord Mills, which is owned by Simon, and the Gaffney Outlets, also owned by Simon Property Group, it makes sense that these are the type of stores that would open in the Biltmore Outlets. 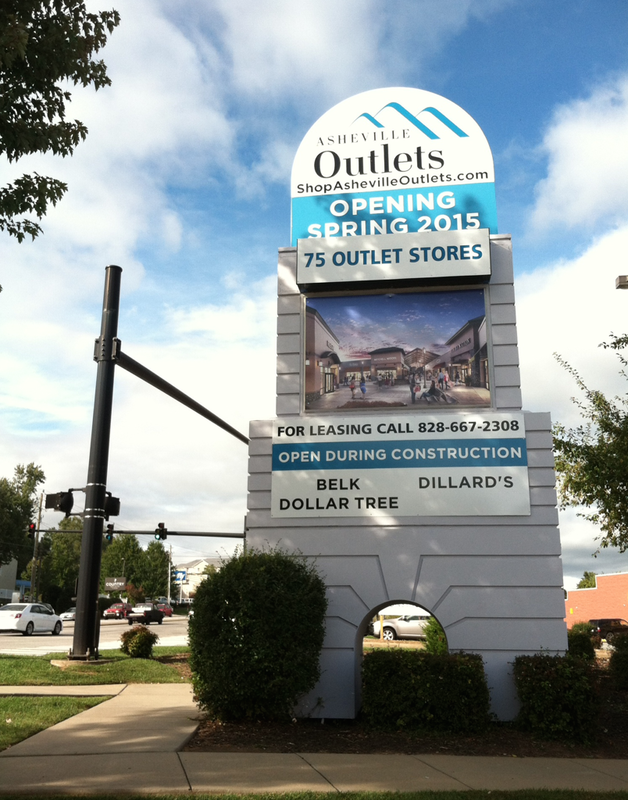 Both Premium and Tanger Outlets have a strong presence in North Carolina with outlet malls in Smithfield and Mebane. That said, Smithfield and Mebane are both over two hours from Asheville so they should not be much competition. With the Biltmore Outlets opening in the spring of 2015, the first major sales event will likely be Memorial Day weekend. For those that may not know, the most popular sales holidays are New Years Day, Martin Luther King Day, Presidents Day, Memorial Day, July 4th, Labor Day, Columbus Day, Black Friday (Day After Thanksgiving) and Christmas Eve. The holidays of Thanksgiving and Christmas are two of the largest when it comes to giving presents and gifts. Look for almost all of the retailers at the new Biltmore Asheville outlets to have some lower prices during sales events. As these events get closer you will likely see billboards in Asheville promoting the major sales. Black Friday and Cyber Monday are the busiest shopping days of the year so the Day After Thanksgiving will prove to be an extremely busy time in this particular area. The one thing I remember about the Biltmore Mall from when I was younger is that it was much easier to get in and out of compared to the Asheville Mall. In all reality, the Asheville Mall is still very hard to navigate from the I-240 exit. 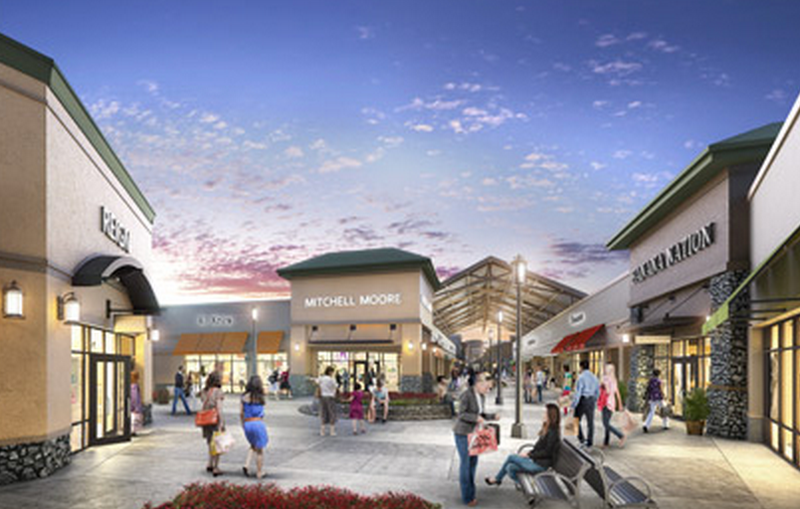 With popular outlet stores being in the Biltmore Outlets the parking will be very important. There is nothing more frustrating than having to park miles away from a mall during popular shopping days. As the construction on this mall comes to a conclusion it will be interesting to see the parking configuration. If the parking is easy it may lead more people to access this Asheville shopping destination rather than the Asheville Mall. Only time will tell. If you are in Asheville during the summer you may want to swing down to the Port Royal Resort in Jasper, Georgia. 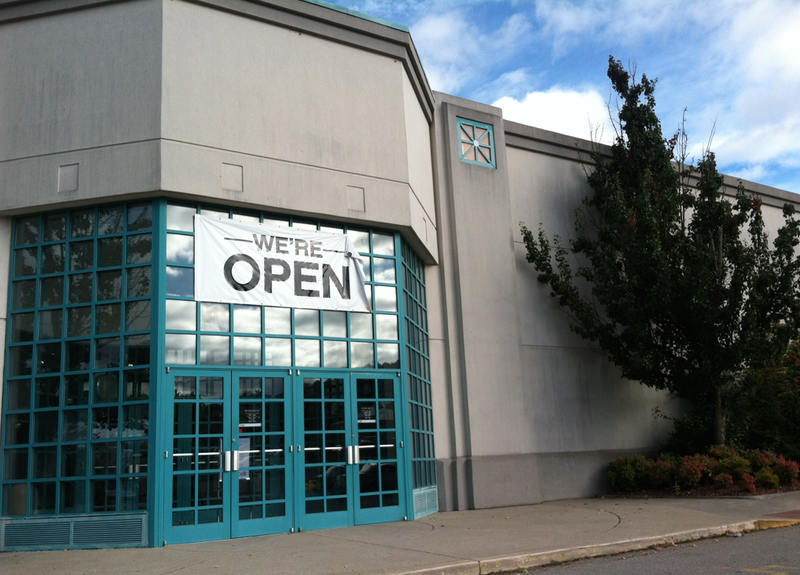 Generally speaking, most stores have similar hours at an outlet mall. If most of the stores are outdoors they can adjust their hours but they like to work together so they are open when the other stores are open. Expect stores to open around 9:00 or 10:00 am and close around 7:00 or 8:00 pm. These hours tend to be a little bit different than shopping malls that are completely enclosed. If there are movie theaters or other night time sources of entertainment some of the restaurants or ice cream stores will have later hours. 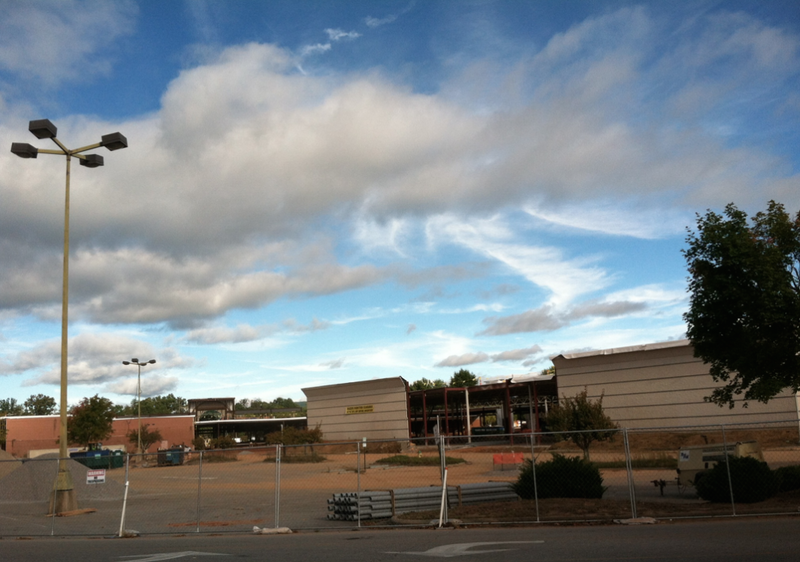 At this point, we are unaware of a movie theater being built at the Biltmore Outlet Mall. One would assume the Cinnebarre would remain open at this location. Slated for a Spring 2015 opening, the Asheville Outlets is already taking part in job fairs across the area, such as the 9th Annual WNC Homecoming Job Fair, hosted on January 6, 2015, at the WNC Agricultural Center. 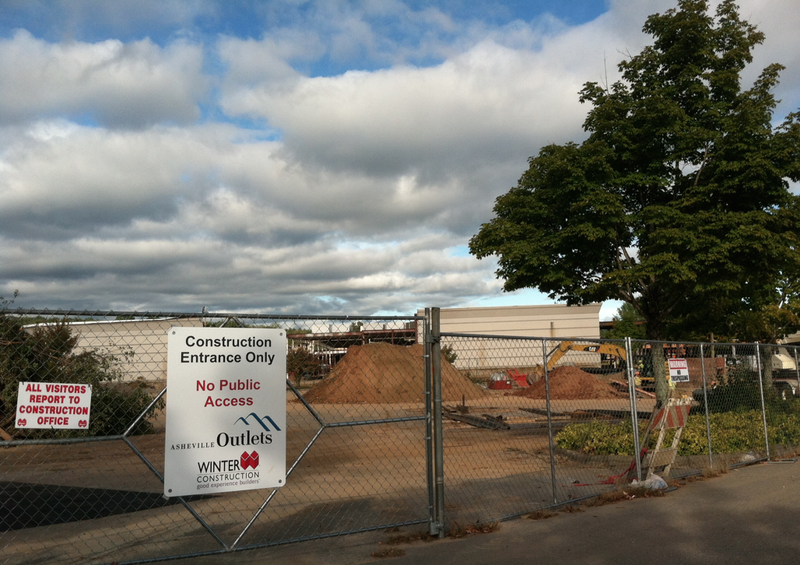 Other New England Development outlet malls provided jobs to upwards of 1,000 individuals in their respective territories. 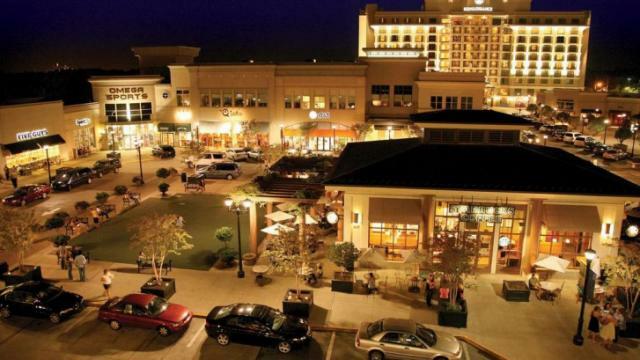 The Asheville Outlets shouldn’t disappoint, bringing not only tourists to the area, but many jobs as well, potentially as many as 1,000 openings will be available for management, maintenance, and sales positions on the property. For more information on jobs at the Asheville Outlets check out their Facebook page, or visit their website for updates about job fairs and hiring schedules. If you have been to the area and would like to leave a review please feel free to do so in the comments below. I would love for this resource to be a sounding board for those that hope to visit the Biltmore Outlet Mall to do some shopping for holiday sales, especially Christmas shopping. 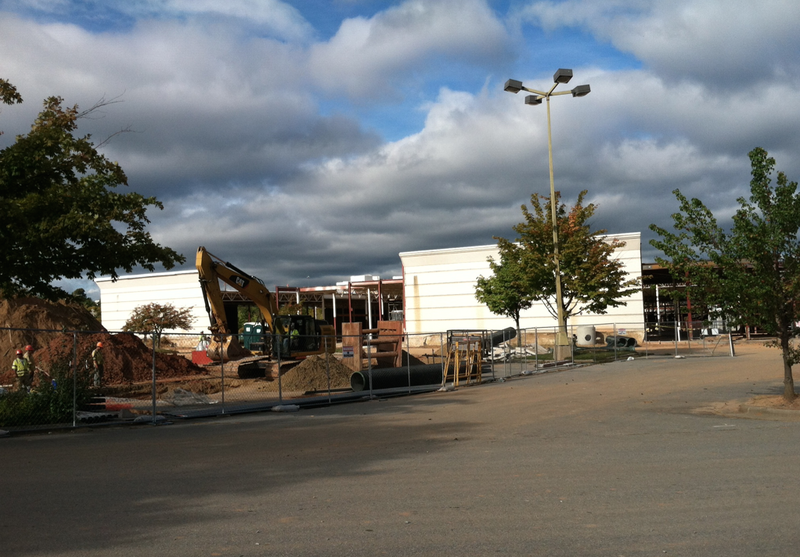 For more updates on the Asheville Biltmore Outlet Mall access this link. When Will Snapchat Bring Back Best Friends? | What is More Important for SEO – Links or Content? I’ve been in the mountains of North Carolina for over 30 years and I can tell you that we need some type of outlet malls. When I was younger we used to go to the Biltmore Mall but it was never the place to shop for low prices. I have been to outlet malls in Mebane and Smithfield, NC and I can promise the prices are much lower. I have no idea what stores are going to be at the Asheville Outlets but whatever they are they are going to allow me to save some money. I will be more than willing to drive an extra 30 minutes to get shoes or clothes that are cheaper. I can only hope there is a Nike Outlet as I pay way too much for my and my kids shoes. Can anyone confirm that there will be a Nike Outlet at the new Biltmore Outlets? Is there going to be a bookstore??? I would hope there would be a Barnes and Noble in the area but nothing have been confirmed. Really hoping for a NorthFace outlet! Really Hoping for another Movie Theatre, that serves food again!! FUN FUN!! Dillard’s Outlet love it, love it, love it!!!!!! RECENTLY WENT TO THE OUTLET MALL..NOT WHEELCHAIR FRIENDLY..WHERES A FOOD COURT? ?VENDING MACHINES ..TACKY FOR THAT KIND OF MALL…AND IF YOU GO TO STORES THERE,S NO COVER FROM STORE TO STORE ..ALSO THERE WAS NO REASON TO TEAR DOWN THE OLD MALL ..IT WAS BEAUTIFUL INSIDE…. Barnes and Noble is one exit south in Biltmore Park. @Jon there is an Asics location there.